It's Not Rocket Science: Happy Spring! Let's talk dirt. Happy Spring! Let's talk dirt. Today is the vernal equinox. 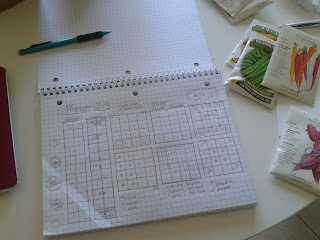 In honor of it, I shall share our garden plans for the season (so far). Sometime last year I discovered how awesome Pike Nurseries is. It's our local nursery but they have really good varieties of veggies, in both seed and set form. We gave up on planting tomatoes and peppers from seeds last summer and just bought some heirloom tomatoes from Pike. It worked great. There you actually get a preview of our expanded garden beds, some pots I got on super-sale from Pike, and the new gate to keep the chickens contained to that corner of the yard. They can no longer get on the deck, which is really nice because this summer we won't have to clear chicken poo away before having guests over. Yeah, gross. Oh, bonus! You can see some of the cool seeds we picked up. We already had carrot seeds, but we figure carrots are soooo cheap at the grocery store ($0.89/lb) that I might as well plant some colorful ones. Same thing goes for beets, which we haven't grown but are looking forward to trying. We also bought purple potatoes. We think we're going to put them in the deep box this year instead of constructing potato towers. Those worked well but we have 2 2x12 boxes and 2 4x4 boxes = 80 more square feet of space to use this year. Anyway, other plans: last fall I planted lots of yellow onions, shallots, and garlic, and those seem to be doing very well. We plan to put tomatoes in the furthest left 2x12 box. We're going to make a cool trellis, I'm excited. We are going to put zucchini in the long box next to that. They can grow into the aisles without taking up extra soil space. I bought spaghetti squash seeds that will go on the ends and trail into the yard. Next to that, we will put some broccoli and collards transplants under the pea trellis. That bed is hard to protect from squirrels but the sets should be well established enough to survive. Maybe. I hope. 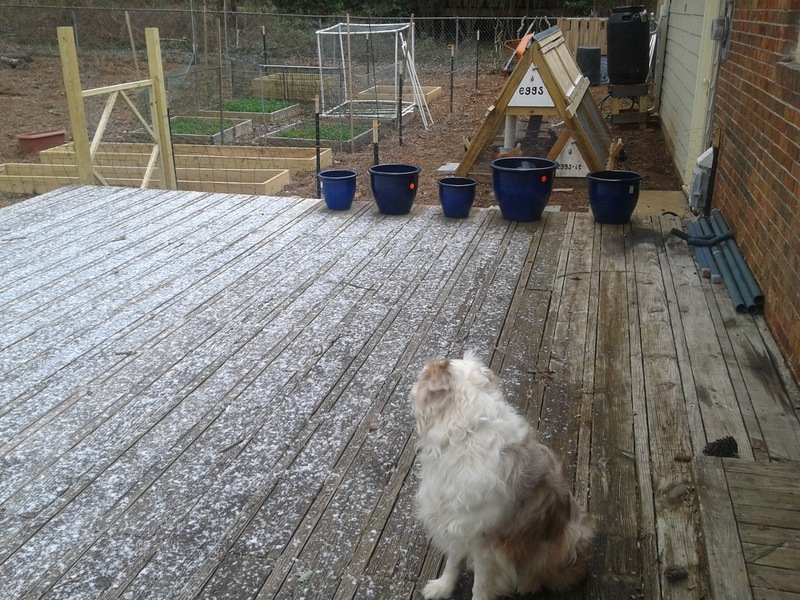 We also planted snow peas and snap peas already, along the trellis that we used for cherry tomatoes last year. I am trying to rotate crops. In the deep box, we will plant our purple potatoes, rainbow carrots, and beets. We also have a 4' x 24' bed on the side of the garage. We have 3 blueberry bushes, 2 blackberry canes, and 1 raspberry cane there now. We would like to grow 1 more blackberry and 2 more raspberries. We also have some strawberry plants there, and are planning to put more strawberries in one of the blue pots on the deck. We also still have the herb box right next to the deck; it's doing great, and my chives and parsley are coming back. The sweet mint, lemon balm, and lavender survived the winter well, as did my sage and thyme. I planted my rosemary tree in the box and cut it way back; I hope it takes off this summer in its new home. I will plant more basil in the summer, and replace the dead orange mint with spearmint or peppermint. What am I missing? Let me know! I also plan to plant herbs along the chicken fence so they can self-medicate. Here is one inspiration source: Tilly's Nest. I will update more on that once it becomes a reality!